Your customer's purchase might be a delicate pie or a large item that is difficult to carry this bag is the final touch for a happy and satisfied customer. These soft loop handle bags keep that pie in one piece until it gets home, meaning the type of bag you choose will make the difference between a happy customer and a disappointed one. These bags are uniquely attractive and durable with a soft loop handle design. The Ameritote® carry out bag is the most reused bag. Soft loop handles and unique bottom gussets help the restaurant bags stand on their own. 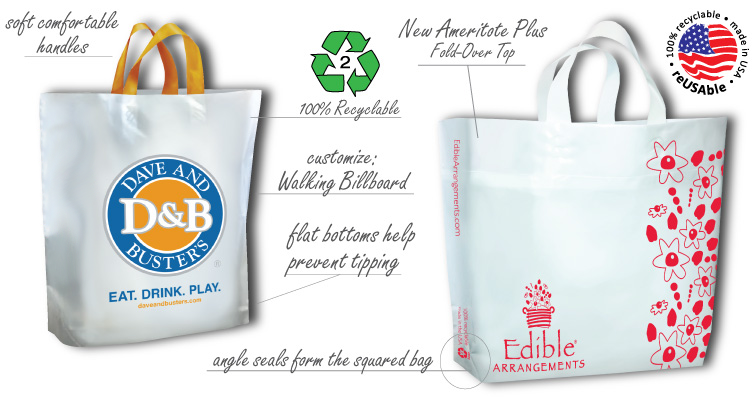 Ameritote® bags are engineered to keep containers flat and prevent tipping and spilling to encourage reuse. 100% Recyclable HDPE #2. Low 6,000 minimum quantity order for custom prints - 4 weeks lead time after art approvals. Just call the soft loop bag experts! 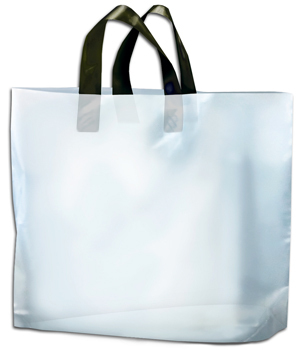 International Plastics is the wholesale supplier of soft loop bags. They make great to-go bags for upscale restaurants that want to discreetly decorate leftovers. These soft loop handle bags display at a glance the value of what's inside. Different sized businesses, from a 2 person operation store, to a multi million dollar a year franchise will see the benefits when they display their products in such high regard.